- Our personal customer service. Very quick and personal service. Really fast access to order and Angela is so helpful at all times. Thank you. I am EXTREMELY happy with the service provided by your company. Very quick and super friendly. Have recommended to fellow teachers. Superb service. Will definitely look to use you again. - Are the scripts, the way you imagine them to be? I don’t really know how you could improve, everything was perfect. I would just like to say a huge thank you from myself , my class and parents/carers for another knock out Nativity. Hugely enjoyed by all. We have already started thinking properly about the Nativity. It was such a success this past year, largely due to the ease of use of your script and the beautiful way you have with words. As a result we are all keen to get planning. Many thanks again. - Any difficulties with purchasing the nativity scripts? I was very happy with my experience of buying on line, I must admit I was a little nervous about the whole thing as I had never done anything like this before but it went so well I would have no hesitation doing it again. From the selection to the purchase and download it took very little time at all. It was really efficient, thanks. Easy service just click and download – couldn’t be easier. Very easy, very quick. Happily would buy from again. Received it immediately with no hitches. Very prompt and hassle free. The service was quick and simple and we received everything we expected. Good service and was quickly received on line. - Were any difficulties, easily resolved? Received the script and had a problem downloading, however when we e mailed you it was fixed within minutes. The service was first class and was very helpful, we were more than happy and when I e mailed you to say how much our congregation had enjoyed it you immediately e mailed me back wishing me merry Christmas so it was a very personal service. Thank You. Thank you so much for sorting all this out for me – I feel like you’re my guardian angel today!! I have downloaded the document and also have a receipt for the refund via email. Thank you once again. Thank you so much for your assistance. I have now been able to download the script and the midi files – very useful for fitting words to music! I am very grateful to you for your personal attention in sorting out the difficulties I was having. Great service. Your telephone call regarding problems we had in purchasing on the web site sealed the deal. - Scripts: Are they easily adaptable, flexible, child friendly, and easy to use? Easy to adapt to your own church settings and cast. But most of the script and directions are perfect as they are. We had 8 kids that wanted to speak reasonable amount and three that wanted a few words. It flexed to our needs. I added a star sequence from another nativity to suit local needs. The children enjoyed it, parents loved it and as the teacher I was grateful for the ease of putting a performance together so painlessly. Thank you Angela! I could adapt the script extremely easily for the number and ability of our children. The script was great to use and adapt to make it our own. It was a good length and it was easy to include all 50 children in some way. Nice to find something that gave us a good starting point that we could adapt to suit our children. One of our most successful nativities – thank you. Loved the script. The children quickly decided which parts they wanted to play. Very easy to interpret – even for me! The script was excellent and easy to use. The rhyming script was funny and inspired! The language used, together with the rhyme, made it so much easier for the children to learn and lovely to listen to. It certainly put a smile on faces – both players and congregation. Mrs Lynn Davidge, Christ the Vine Community Church, Milton Keynes. I felt the script was so adaptable and we were able to really make it our own. Everyone got to play the part they wanted to. We even added in a donkey because a boy had made a costume for this in an art activity and we wanted to use it. I didn’t need to adapt any part. Very, very satisfied with script. One of the best productions that the children have been in. Was able to adapt to the size of our cast very easily. We used songs that were familiar to our students. They blended nicely into your script. I adapted it quite a bit for adults and children, to make sure everyone had a part – in fact on the day we had to change it a bit as the bad weather meant that some of the cast couldn’t get to church… very easy to adapt – even I managed it without any poetry skills! 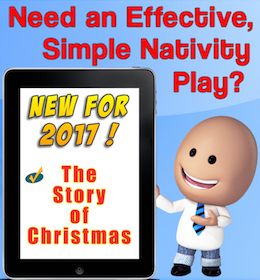 Just wanted to thank you for writing the “Children’s Nativity Story” script. Everyone loved it and the kids did a great job, plus, this time of year is so busy for me and yet I was able to direct this program easily. - Are the downloadable documents practical? Easy to use due to rhyming lines for children in our group aged 6 to 10. Great for leaders as we only had to photocopy and cast. It was very user friendly. Both for children and leaders. The original script was super for leaders so we could get a feel for the flexibility of the play. I thought the lay out was excellent but being able to transfer it into a word document that could be adjusted if you wanted to meant anyone who was not happy with the layout or any particular parts or lines they could just delete them or add in parts. Mrs. J. O’Reilly, Scoil Maelruain, Tallaght in Dublin Ireland. Script was set out well with clearly defined parts for each player/s which made it easy to follow. Definitely worthwhile as you can add the children’s names without too much faff! Definitely! Having the downloadable copy was invaluable as we could adapt it to meet our own needs and personalise it. Very good value. The downloadable files made access to the script instant and being able to edit the parts we needed to was a great help especially when we gave the children their lines to learn. - In your experience as a customer, are our scripts good value? Is there anything that we may have overlooked? Good value. Everything you need to put on a production. Very definitely value for money. The whole package is easy to use and caters for all ability levels. The rhyming helps all children to remember their lines. The only thing I had to worry about was costumes! Another music file with someone singing the songs would have been helpful, there was one tune I struggled a little bit with as I was not familiar with it and think if I was listening to someone singing it I would have picked it up quicker. I thought it was great value and online is the best way to get the script, no need for trawling through specialist book shops etc. Definitely more value than others I have seen. Very much so, and convenient!